Designed and engineered in cooperation with MSI®, this monoblock uses award-winning EK-Supremacy EVO cooling engine to ensure best possible CPU cooling. This water block directly cools Intel® LGA-2066 socket type CPU, as well as the power regulation (MOSFET) module. Liquid flows directly over all critical areas, providing the enthusiasts with a great solution for high and stable overclocks. 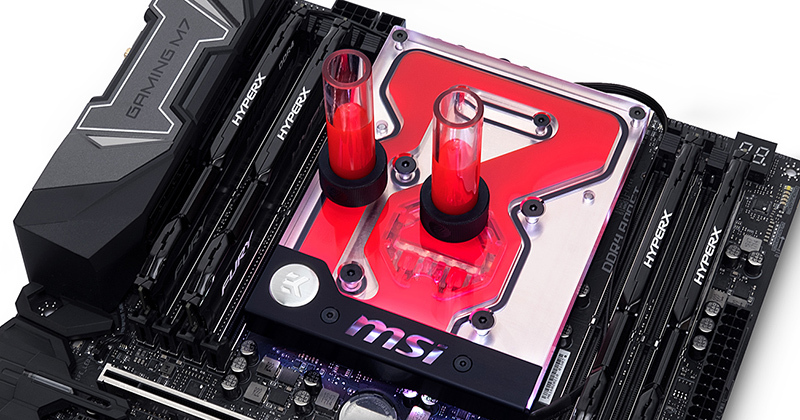 Like with every EK monoblock, EK-FB MSI X299 Gaming Pro Carbon RGB features high flow design and this monoblock can be easily used with the system using a weaker water pump as well. This kind of efficient VRM cooling on an X299 platform additionally brings down the CPU temperatures compared to the traditional CPU water block and stock VRM heatsink cooling solution.